An astronomer studying small irregular galaxies discovered a remarkable feature in one galaxy that may provide key clues to understanding how galaxies form and the relationship between the gas and the stars within galaxies. 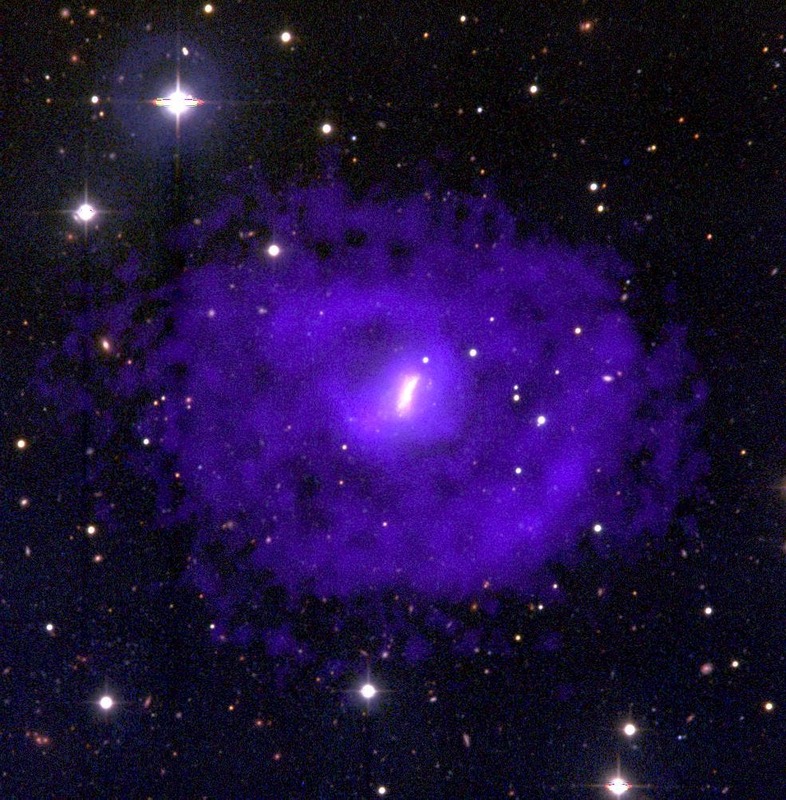 Liese van Zee of Indiana University, using the National Science Foundation's Very Large Array (VLA) radio telescope, found that a small galaxy 16 million light-years from Earth is surrounded by a huge disk of hydrogen gas that has not been involved in the galaxy's star-formation processes and may be primordial material left over from the galaxy's formation. "The lack of interaction between the large gas disk and the inner, star-forming region of this galaxy is a perplexing situation. When we figure out how this has happened, we'll undoubtedly learn more about how galaxies form," van Zee said. She presented her findings to the American Astronomical Society's meeting in San Diego, CA. The galaxy van Zee studied, called UGC 5288, had been regarded as just one ordinary example of a very numerous type of galaxy called dwarf irregular galaxies. As part of a study of such galaxies, she had earlier made a visible-light image of it at Kitt Peak National Observatory. When she observed it later using the VLA, she found that the small galaxy is embedded in a huge disk of atomic hydrogen gas. In visible light, the elongated galaxy is about 6000 by 4000 light-years, but the hydrogen-gas disk, seen with the VLA, is about 41,000 by 28,000 light-years. The hydrogen disk can be seen by radio telescopes because hydrogen atoms emit and absorb radio waves at a frequency of 1420 MHz, a wavelength of about 21 centimeters. A few other dwarf galaxies have large gas disks, but unlike these, UGC 5288's disk shows no signs that the gas was either blown out of the galaxy by furious star formation or pulled out by a close encounter with another galaxy. "This gas disk is rotating quite peacefully around the galaxy," van Zee explained. That means, she said, that the gas around UGC 5288 most likely is pristine material that never has been "polluted" by the heavier elements produced in stars. What's surprising, said Martha Haynes, an astronomer at Cornell University in Ithaca, NY, is that the huge gas disk seems to be completely uninvolved in the small galaxy's star-formation processes. "You need the gas to make the stars, so we might have thought the two would be better correlated," Haynes said. "This means we really don't understand how the star-forming gas and the stars themselves are related," she added. In addition, Haynes said, it is exciting to find such a large reservoir of apparently unprocessed matter. "This object and others like it could be the targets for studying pristine material in the Universe," she said. Haynes also was amused to point out that a galaxy that looked "boring" to some in visible-light images showed such a remarkable feature when viewed with a radio telescope. "This shows that you can't judge an object by its appearance at only one wavelength — what seems boring at one wavelength may be very exciting at another."